To evaluate the prevalence of and factors associated with internal mammary node (IMN) adenopathy on MRI and PET/CT used for initial staging in patients with operable breast cancer. 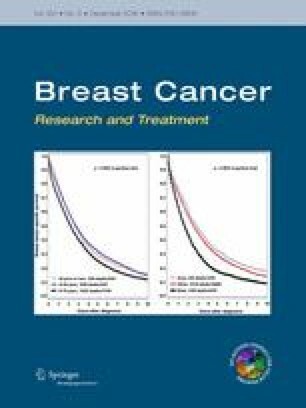 A total of 1320 patients diagnosed with invasive breast carcinoma between January 2011 and December 2015 underwent MRI and PET/CT for initial staging. The patients were considered to have IMN adenopathy when MRI revealed IMNs with the longest diameter of 5 mm or greater and a standardized uptake value greater than that of the mediastinal blood pool/contralateral parasternal area on PET/CT. The prevalence was determined as overall percentage of patients with IMN adenopathy, as well as percentages among patients who received neoadjuvant chemotherapy and those who did not. The association of IMN adenopathy with factors was evaluated using multivariate logistic regression analysis. Of the 1320 patients, 35 patients [2.7 %; 95 % confidence interval (CI) 1.8–3.6 %] had IMN adenopathy, with a total of 49 IMNs. Among patients without and with neoadjuvant chemotherapy (n = 1092 and n = 228, respectively), IMN adenopathy was identified in 13 (1.2 %; 95 % CI 0.6–2.0 %) and 22 patients (9.6 %; 95 % CI 6.0–14.6 %), respectively. Inner tumor location [odds ratio (OR) 5.9; P = .002] and positive axillary lymph node status (OR 4.4; P < .0001) were associated with IMN adenopathy. IMN adenopathy was identified at initial staging with PET/CT and MRI with a prevalence of 2.7 %. Inner tumor location and positive axillary lymph node status were associated with IMN adenopathy. This work was supported by Biomedical Research Institute Grant, Kyungpook National University Hospital (2016).